A "youngsters party" which police said went "a little wrong" ended when two officers were hurt breaking up a fight. 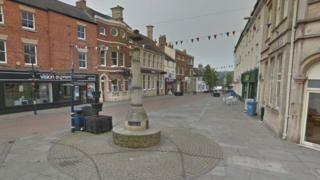 Five people were also arrested in the brawl in Melton Mowbray's High Street on Saturday night. Oakham Police tweeted it had "all gone a little wrong in #Melton youngsters party", adding "cops from all over" had been called in. A special constable and a full-time officer were both hurt but their injuries were not serious. Leicestershire Police Chief Constable Simon Cole tweeted that the attack on the officer was "#unacceptable". Police said a "private under 18s" party had been held nearby. The special constable injured her shoulder while trying to make an arrest in the fight, which broke out at about 23:10 GMT. The other officer hurt his wrist. A 19-year-old girl was arrested on suspicion of assaulting an officer, two 17-year-old boys and a 16-year-old were arrested suspicion of breaching public order and a 17-year-old boy was arrested on suspicion of assault. All have been bailed or dealt with by way of "a community resolution", police said. Image caption Leicestershire Police Chief Constable Simon Cole called the injury "unacceptable"